3 November 2010, at 9:50a.m. 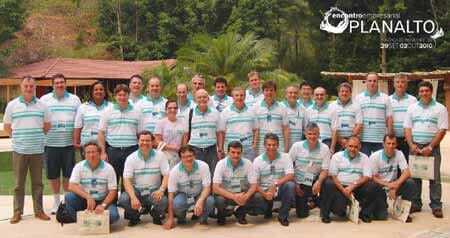 BRAZIL - Granja Planalto officially presented the Hubbard Flex at their 8th Business Meeting last month. From 29 September to 2 October, Granja Planalto held its eighth Business Meeting together with Hubbard do Brasil in the Pousada do Rio Quente Resort in Rio Quento (GO). Traditionally this event gathers the main business people of the breeders sector in Brasil and this year it featured the special participation of Frédéric Grimaud, President of Groupe Grimaud, and three of the main directors of Hubbard. The objective of this event was to present Hubbard and its products, which from now on is part of Planalto's portfolio. The sales and distribution of the Hubbard breeding stock by Planalto is part of the agreement signed in August of this year between Planalto and Hubbard do Brasil. The main focus of the Business Meeting was the Technical Seminar. In his welcome speech, Mauro de Freitas Pereira, Vice-President of Planalto, emphasised the relevance of the event and the integration between the participants. He also highlighted the importance of the partnership between both companies, bringing a highly competitive product to the Brazilian market. The presentations started with Valter Bampi's lecture about the importance of water in the production period. Mr Grimaud presented the core activities, bio-pharmacy and animal genetics, of Groupe Grimaud. For Hubbard Stéphane Duthoit (Managing Director) and Olivier Behaghel (Business Director) highlighted Hubbard's activities and products in Brazil and the rest of the world and Yves Jego (R&D Director) gave an insight into the focus and developments in the R&D department of Hubbard. To finish the seminar, Dilvo Grolli, President of Copavel, gave an overview of Brazil's agribusiness and the globalisation of the meat sector.